Ok now this comes under my bizarre category. 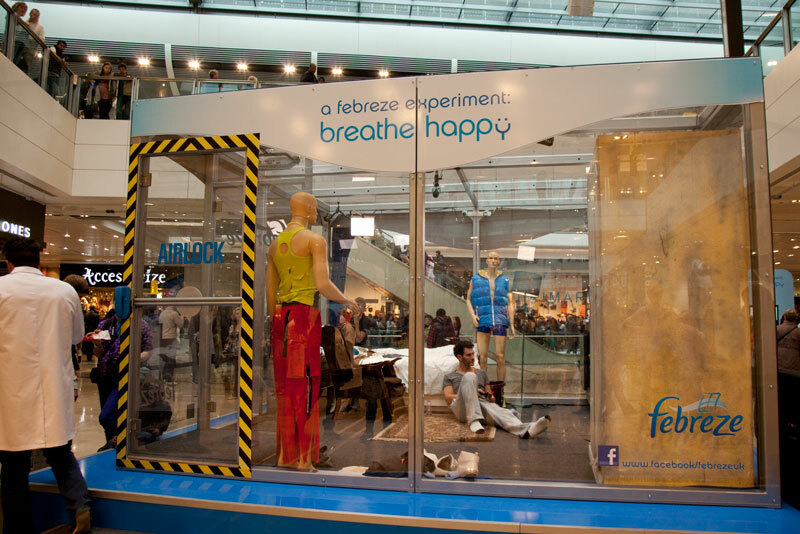 Febreze, yes those people who make products to make your home smell lovely, are conducting an experiment at Westfield Stratford City shopping centre. The man has been in the see through sealed box since Wednesday. Hosted by TV presenter Stephen Mulhern encourages the public to assist him in creating even more smelly activities for the man to partake in. (you can vote via the febreze facebook page). Wednesday's challenge was grooming a dog. Thursday he is slicing a box of onions and peeling hard boiled eggs then tossing them into the bin, that will remain locked in the box with him. YUK. He will be let out Saturday morning. Pooh! Febreze will then go in and spray everything with their products. Guess they have fingers very crossed hoping the experiment works. You can go down and check for yourself how bad it smells as they open the door. To get to Westfield from London take the new fast train from St Pancras. It takes 7 mins! Although my journey came in slightly under that. Very impressive. Good job the other 2 are dummies! Blech!!! Strange indeed! They could not have paid me enough to get locked in a smelly box like that!!! Too bad you can't pelt him with eggs like many enjoyed doing to David Blaine back in '03. Yuck - not a job for me!! Oh my...I simply don't know what to say! I'm completely befuddled. Partly, perhaps, because I don't understand what's going on. Are you saying a man is living in a box with a dog and a pile of old sliced onions? And it's an advert for spraying smelly scented chemicals? Which odour will be worse?